Some landlords in Wyre are refusing to accept tenants on Universal Credit, with the rollout of the controversial new system meaning cash for rent is paid to tenants rather than directly to landlords, council papers showed. It means “the availability of suitable accommodation continues to be a challenge”, a report by neighbourhood services and community safety boss Coun Roger Berry said. The report said there had been hikes in the "demand and the complexities of those in need of housing assistance", and added: "Although the overall number of [cases] has only marginally increased - from 492 in 2017/18 compared with 506 in 2018/19 - the number of those in need of assistance has significantly increased. "The availability of suitable accommodation continues to be a challenge and the full roll-out of Universial Credit (UC) in December 2018 is proving to be a barrier to some private sector landlords in accepting prospective tenants on UC." Council staff are "continuing to forge relationships" with the landlords to "increase available accommodation", Coun Berry said, while more workers have been drafted in to the housing team. But the government, which introduced it gradually across the country, said it will encourage people to get jobs instead of living on benefits that pay more. Newspaper stories have shown cases of people losing their homes and people having to top up food supplies from food banks while waiting for their first Universal Credit payment, which can take weeks. Ahead of Universal Credit being rolled out late last year, a group of Wyre councillors expressed their concern. Councillors Beavers, Fail, Shewan and Stephenson said: “Universal Credit is not fit for purpose. The four to six week wait for claimants to receive their benefits is unacceptable and will impact on the vulnerable and the poor resulting in Wyre children going hungry and residents’ homes being put at risk. “The idea that all workers are in jobs where they are paid a month in arrears ignores the reality for the 1.5m workers who struggle on zero hours, insecure jobs or forced self-employment. 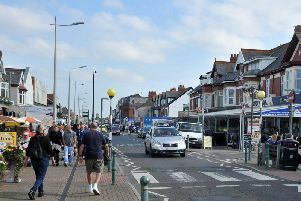 The Conservative MP for Blackpool North and Cleveleys, Paul Maynard, said at the time: "Universal Credit is an extremely important change to the way benefits are delivered, ensuring support is given to those who most need it and that those who can work will always be better off doing so.